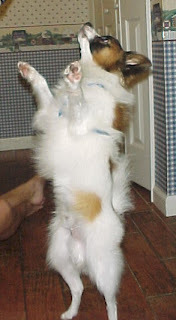 All Things Dog Blog All Things Dog Blog: Toki Poki Pet Trading Cards Awarded....Who was a Winner? Toki Poki Pet Trading Cards Awarded....Who was a Winner? Oliver is dancing! He's happy to announce the winners of the Toki Poki Drawing, and he's also celebrating his birthday. What a fun way to enjoy a happy day--giving away prizes. Today's winners are: Mona, Karen, and Tammy. Each will receive a Toki Poki Tshirt, sample package of Toki Poki trading cards (complete with Oliver and Tanner's cards included!) and a sample of Nutrish dog food, by Rachel Ray. If you missed last week's post about Toki Poki trading cards, you may enjoy reading up on this fun new way to social network for pets at this link. I think it's a perfect fit for kids of all ages. Founder Christy Myre has lots of plans for games and children's activities on the Toki Poki site, so we hope you'll visit and enjoy meeting a few new furry friends. Be sure to look for Oliver and Tanner. They'd be hurt if you didn't stop in to say hello. This morning's email included a birthday greeting from the folks at Toki Poki, just one of their little surprises. Oliver enjoyed helping me write back to Team Toki Poki to say thank you. We even told Toki about Oliver's party and the yummy treats. You missed it? That was so yesterday; you can read all about it at Happy Birthday Oliver! I'll pop in a photo here of the goodies our winners are getting, so you can drool. That's okay though. Remember, in the dog world, Drool is Cool. To win our great prizes, you have to comment on FB, or the blogs. Don't forget about 5 Minutes for Fido; the dogs would be so sad. Before I go, let me remind you that tonight's post will officially begin the Woof and Meow series. If you have both species in your home, there is good reason to keep tabs on this series--great information and huge prizes. Be sure to watch as this fab series unfolds, starting tonight. And a little P.S. : The prizes will be announced tomorrow. Be there or be square! Happy tails!